Authentic Chesapeake Bay Skipjack, The H.M. Krentz; cruising in St. Michaels, Maryland; photo by Talking Tree on Flickr (noncommercial use permitted with attribution / share alike). Originating in the 1890's, skipjacks are the last working boats under sail in the United States. The name "skipjack" refers to fish such as skipjack herring, skipjack mackeral, and skipjack tuna that leap in and out of the water. Skipjacks can sometimes resemble the fish as they come about quickly to make continuous passes or "licks" over oyster beds. Ranging in length from 25 to 50 feet, the hearty skipjack is known for speed and is powerful in light winds. 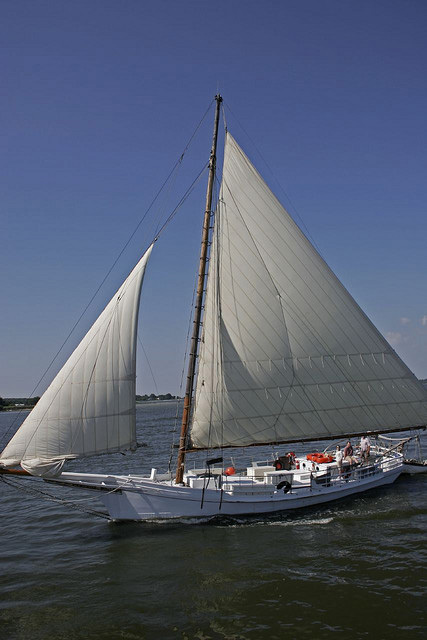 Skipjacks have a shallow draft with centerboard and carry a single mast, two-sail sloop rig.The remaining Chesapeake Bay Skipjack Fleet has been recognized as a national treasure in danger of extinction. 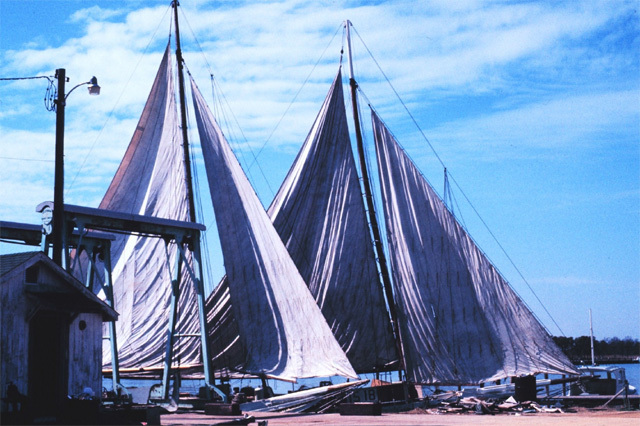 Skipjacks drying their sails alongside the dock in Chesapeake Bay, Maryland; photo from NOAA's America's Coastlines Collection.